The Land of Lincoln’s out-migration crisis is the most severe in the region and worsening over time. Illinois’ out-migration is far worse than any other state in the region, and is clear evidence that legislative leaders have created a comparatively unattractive, anti-growth state. The Land of Lincoln is losing one person to out-migration every five minutes. This rate is so rapid it has caused the state’s population to shrink two years in a row, while the population of every other state in the region has grown. But some commenters downplay the crisis by asserting that Illinois’ out-migration is normal for the region and has been going on for a long time. These commenters ignore the rarity and magnitude of Illinois’ problem. Illinois’ current out-migration is fundamentally different when compared with out-migration in previous years and from other states. Illinois has seen net out-migration for decades, but Illinois’ out-migration rate is currently the most rapid pace ever recorded. The loss of prime working-age adults, not retirees, is driving Illinois’ out-migration. Millennials are leaving fastest. Nearby states such as Michigan and Ohio have seen their out-migration rates fall dramatically in recent years as they achieved better job growth. Illinois’ out-migration rate as a percentage of population is the highest in the region and dwarfs rates in surrounding states. As of the 2010 Census, Illinois had 18 percent of the combined population of the 12 Midwest states plus Kentucky (a border state). In the five years for which data are available since 2010, Illinois has been responsible for 44 percent of the combined outmigration from these states. The Census Bureau records that from April 2010 to Jul 2015, these states experienced a net out-migration of 975,000 people. Illinois’ share of that loss is 425,000. 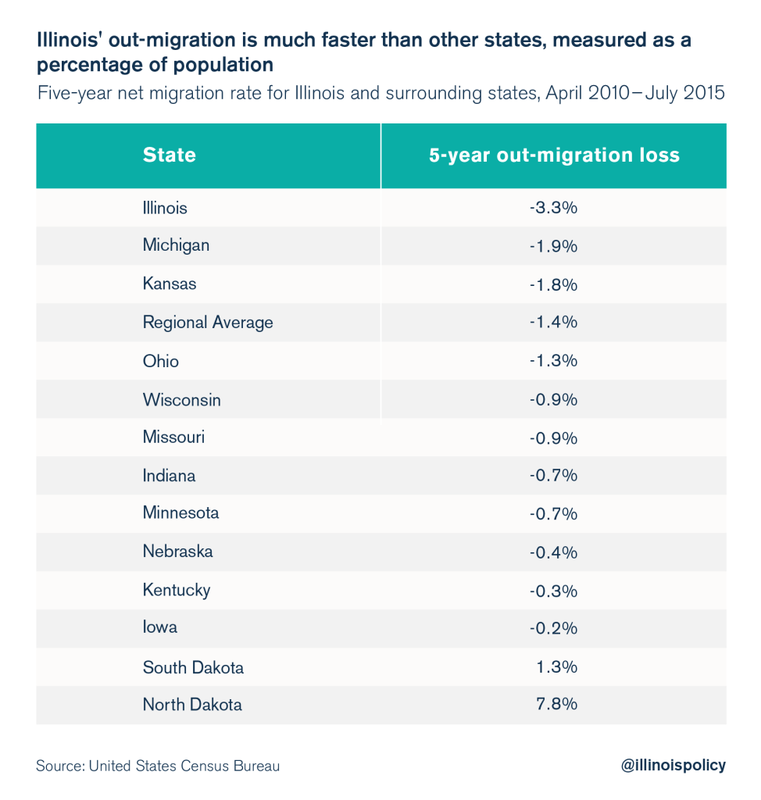 Out-migration from Illinois the last five years is equal to 3.3 percent of the state’s population, far higher than next-worst Michigan’s net loss, which is equal to 1.9 percent of population. 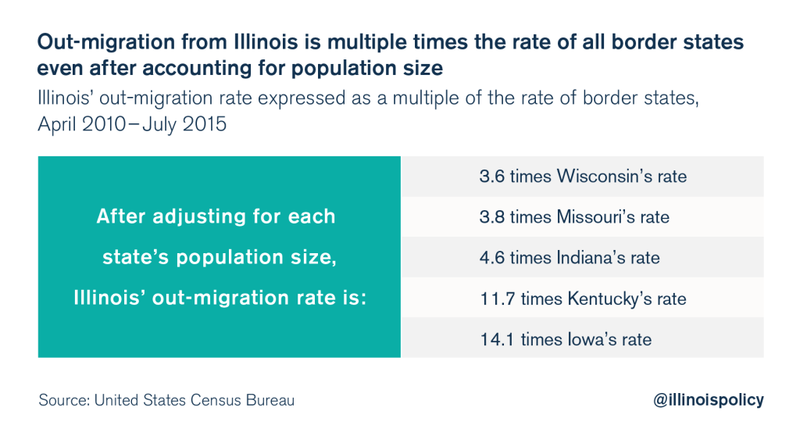 Border states Wisconsin, Missouri, Indiana, Kentucky and Iowa all have out-migration rates below the regional average, and far below Illinois’ pace. This means people are leaving Illinois at a much more rapid clip than they are leaving surrounding states, even after adjusting for state size. Illinois’ five-year exodus rate ranges from 3.6 times the rate of Wisconsin to 14 times the rate of Iowa, after accounting for difference in population size. Illinois’ out-migration is not normal. It is a clear sign of political and economic crisis. For now, Illinois is still the most populous state in the Midwest and the fifth-most-populous state in the country. However, states such as Ohio and Pennsylvania are gaining on Illinois in terms of total population, and Pennsylvania is on pace to catch Illinois just after the 2020 census. This isn’t because Pennsylvania has been doing so well, it’s because Illinois has been doing so poorly. The top goal of state policy leaders should be to make Illinois a state that grows again. Poor policy decisions have threatened Illinois’ prospects for a vibrant future, which is reflected in the state’s diminished population. Policymakers should correct course by enacting tax, spending and regulatory policies that foster growth and population gains, and abandon the current regime, which smothers job opportunities and drives Illinoisans to other states.